Capital Partners CDC Goes Mobile! Capital Partners CDC of Atlanta, GA has recently launched their new mobile web site (not a mobile app.) It is designed as a marketing tool for lenders who wish to calculate potential SBA (Small Business Administration) 504 loans. The website will be marketed to bankers, CPAs and other financial firms, so that lending partners will be able to get a quick estimate on a 504 loan via any smart phone at any time. 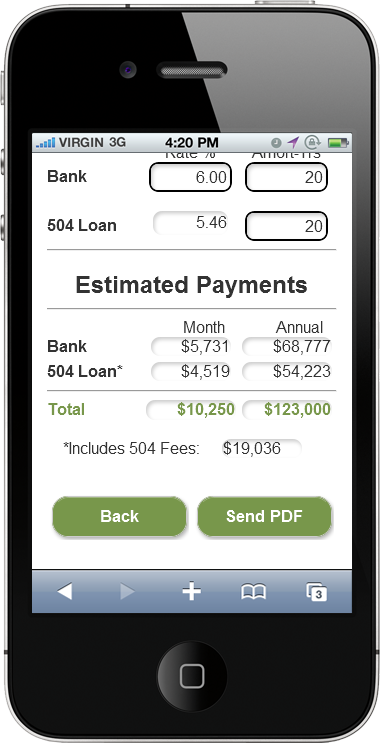 Bankers and other lending partners are using mobile technology more consistently, so having this 504 loan calculator available on a phone will strengthen their working relationships. It also deepens their connection since it provides a speedy way for the Lender to contact a CPCDC Loan Officer with any questions. By just saving their contact information on the home screen of the phone, they can easily speed dial their favorite loan officer. Shown below are a few screen shots of the CPCDC mobile web site. The left image is the home page, and the center image is the estimated payment results from a loan calculation, which can easily be emailed to anyone in pdf format. The right image shows how easy it is to contact staff members with one-touch technology. Their lending partners can use this website by scanning a Quick Response (QR) code on print media, or by typing the domain name into any browser on a smart phone. When it is accessed the first time, it can be easily saved to the desktop on the phone. Try it yourself – just type in CPCDC.com. We offer these brandable, customized calculators to CDCs across the nation. If you’d like to have one for your CDC, give us a call at 317-299-5150, or email sales@provim.net. We’ll gladly explain what is available and all the options. This entry was posted	on Friday, November 15th, 2013 at 3:33 pm	and is filed under 504 Loan Calculators. You can follow any responses to this entry through the RSS 2.0 feed. Both comments and pings are currently closed.